Turn your business dreams into reality. Entrepreneurship is thriving on the Syracuse University campus and students from any major or school have the chance to embrace the entrepreneur within and follow their business ideas. Whether it’s just an idea, a passion to help someone with a business idea, or you’re already making revenues by selling your products/services, the Panasci Business Plan Competition is for you. The Falcone Center for Entrepreneurship and the Department of Entrepreneurship and Emerging Enterprises (EEE) in the Whitman School of Management announce a call for submissions for the 2012 Panasci Business Plan Competition. 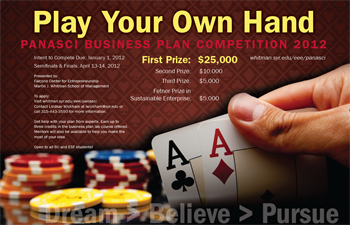 The competition accepts business plan ideas from students in any college at SU, in addition to the SUNY College of Envinronmental Science and Forestry, at both the graduate and undergraduate levels. It will take place April 13-14, 2012, and is made possible through support from Henry A. Panasci, founder of Fay’s Drugs and former chairman of Cygnus Management Group, a venture capital and management consulting firm. The top three teams in the competition are awarded prizes of $25,000, $10,000 and $5,000 respectively, based on potential for growth and the attraction of outside financing. The Fetner Prize in Sustainable Enterprise awards $5,000 to the team whose plan would have the greatest positive impact on society and the natural environment. In order to participate, you must complete the intent to compete and entrant certification forms by Jan. 1, 2012. Hard copies of the forms are available at the Falcone Center in the Whitman School, Suite 116. During the two-day competition, 16 semi-finalist teams will be chosen to present to a panel of expert judges on the first day. Finalists will then compete for the grand prize on the second day. To register, click here. Notable winners of previous Panasci competitions include thriving businesses Dream Water, an all-natural liquid sleep supplement that was presented on “Shark Tank” following its first-place win at the competition; Rylaxing LLC, named one of “America’s Coolest College Start-ups” by Inc. magazine, whose signature product is the Rylaxer; and Funk ‘n Waffles specialty café and music venue located in the South Crouse Alley of SU’s Marshall Street businesses. Throughout the spring semester, teams will work to write a comprehensive business plan. EEE faculty members will work with students to improve their business plans for the competition in a weekly business plan laboratory. The Falcone Center also offers special sessions with partnering accounting and law firms, providing financial presentations and critical guidance in areas such as intellectual property. For more information, contact Lindsay Wickham, Falcone Center events and communications manager, at (315) 443-3550 or lwickham@syr.edu.